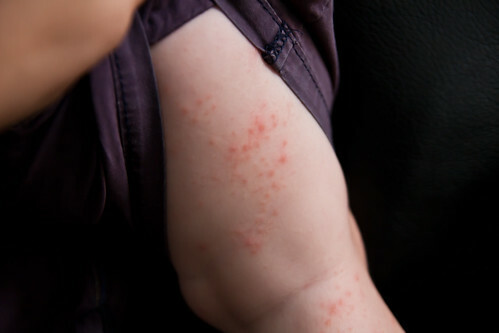 I wonder if it's because Koen has such sensitive skin but man, he has it (Hand Foot Mouth Disease) way worse than Kai. Kai has maybe 30 blisters total on his feet hands and torso. Koen has at least 200 spots (that become blisters) on each foot and they are all over his entire body. He has masses of open blisters all over his arms and legs. Under his diaper, he is covered everywhere. My poor little Bubba. It makes me teary eyed looking at him! He is doing pretty well considering, just grumpy and not sleeping. His skin is so sensitive so this is really doing a number on him. Ryen just had hand, foot and mouth too and it was gross. Then it cleared up and now he has some other viral skin rash. Seriously? What's with these kids? It seems like Ryen gets everything that anyone within a 10 foot radius of him has. Awww...poor little guy and poor mom too! Poor little buddy! I hope this passes soon! Yuck. Yeah, think I will pass on the playdate for the next while. Hope koen and kai feel/act better soon! These poor little kiddos! This reminds me of chicken pox dates back in the day...not that I want one...just a reminder of sharing popsicles! Oh how awful!! I hate seeing my kids uncomfortable. I hope that it clears up quickly so you can get back to the fun.